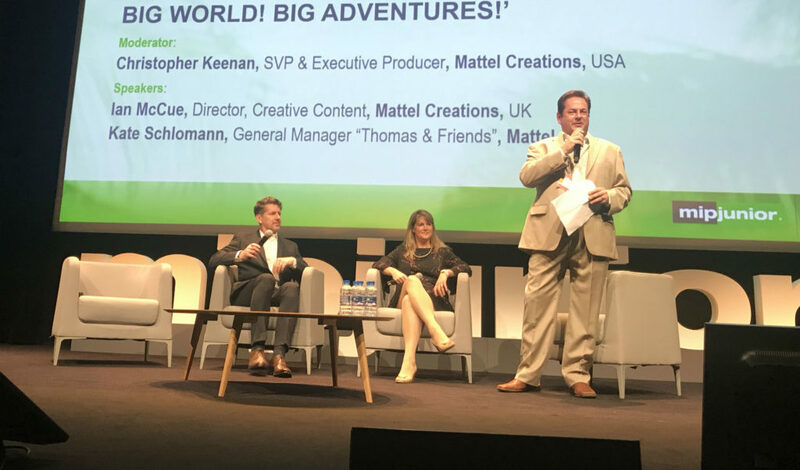 This year’s MIPJunior included two World Premiere Screenings, for Mattel Creations’ new series Thomas & Friends: Big World! Big Adventures! and for Digital Television Russia’s animated series Heroes of Envell. Thomas & Friends (pictured above with the Mattel team at the MIPJunior Opening Night Party) went first on Saturday, with an emphasis on some new friends created specifically for the new show with diversity and a global outlook in mind for the 26 x 11-minute episodes. “Thomas is truly a beloved brand, however he has to remain competitive for today’s pre-school environment,” said Kate Schlomann, general manager of Thomas & Friends for Mattel, which conducted research with children to pick their brains on how Thomas’ adventures could evolve. “We haven’t messed too much with the core Thomas DNA,” promised Christopher Keenan, SVP and executive producer at Mattel Creations, as he introduced a series that will take Thomas away from his home-island of Sodor to visit China, India and Australia for the series with more countries in store for an upcoming movie. “One of the exciting things about taking Thomas around the world: it really opens up our world. We have so many more exciting things to write about from new characters, new locations, just adding new colours. And we can do lots of stories around animals, which we know children love,” said Ian McCue, director of creative content at Mattel Creations. The show will see Thomas spending four or five episodes in each country, while the new engines that he meets will be key to the series’ appeal. “We’re introducing two new female engines… to just really get a better gender-ratio balance in the show. Up until now we’ve had six boys and one girl in the sheds. It didn’t seem very fair! Now we’ve got three boys, three girls and our hero Thomas making it seven,” said McCue. One of the driving forces behind this change was explained by Schlomann: “About 50% of our audience is girls,” she said. But Mattel has also partnered with the United Nations to include its sustainable development goals in the series, including issues like gender equality, climate change, eradicating poverty and hunger, and improving education and sanitation. Winter also talked about one of the new trains in the series, Nia, who hails from Africa. “We really wanted to make sure that the character we were bringing to life on screen was a good representative of Kenya,” she said. “But also that she’s a strong, empowered woman, who boys and girls alike can really look up to.” Nasser chipped in: “Showing that from a very young age is very important for full empowerment as they grow older,” he said. Mattel was keen to stress that Thomas & Friends: Big World! Big Adventures! won’t just be crowbarring serious issues into its plotlines at the expense of entertainment. McCue promised a pacier feel to the 11-minute episodes, and some surprises for young viewers. “We’re adding fun to the show, and adding humour,” said McCue, noting that the new show will feature Walter Mitty-esque fantasy sequences of Thomas’ daydreams. “From what would it be like to be a space rocket to what would it be like to be chased by a dragon. It allows us to go a bit off-track into these fantasy moments!” said McCue. ‘What’s important is we’re finding the right balance between reinvigorating the show whilst retaining the core DNA of what Thomas is all about. And that’s where it’s working really well for us. 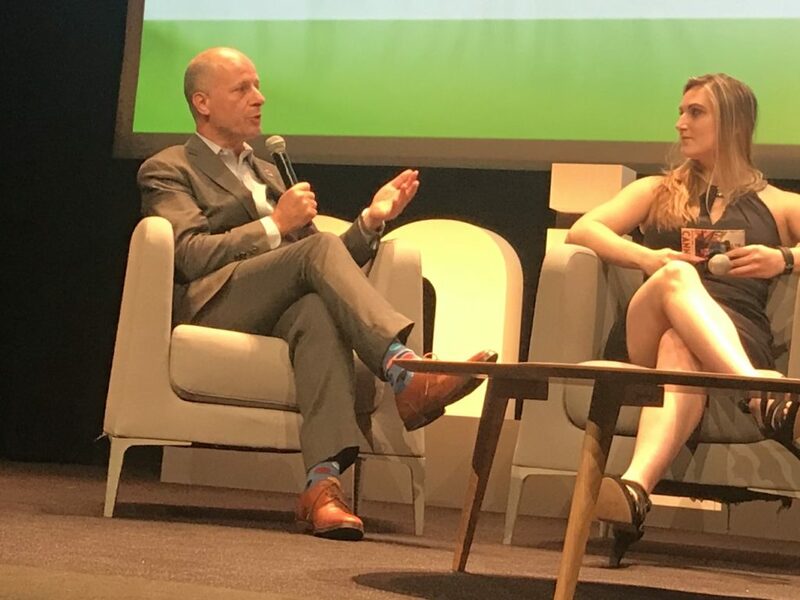 It’s important to keep that heritage that Thomas has had for 73 years.” After the screening, the panelists took the lead as MIPJunior attendees boarded a customised-for-roads Thomas train to the conference’s opening-night party. On Sunday, DTR and Signal Media presented the World Premiere Screening of Heroes of Envell. Created by Anton Lanshakov and Evgeny Golovin, it takes place in junior high, where four promising students find a laptop containing a mysterious game. Like Jumanji for digital kids, the laptop turns out to be a portal into the game world itself—where the adventures and dangers are very real. 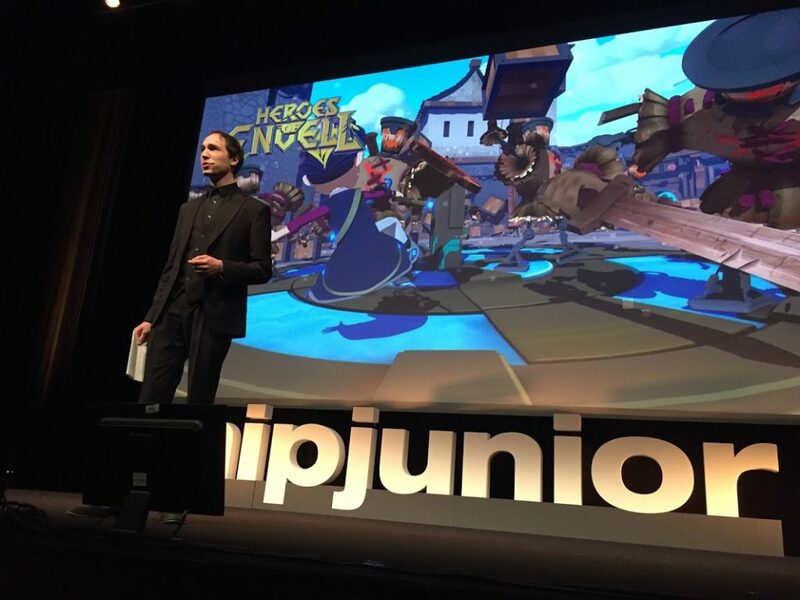 This screening inaugurates the first ever New Creative Territories to Watch segment at MIPJunior, featuring brand-new animated series from creatively emergent territories. Heroes of Envell—made for 8- to 14-year-olds—is the result of these considerations. And its mix of retro-gaming aesthetics and 3D animation, coupled with the deep stakes shared between its protagonists, is incredibly cool. 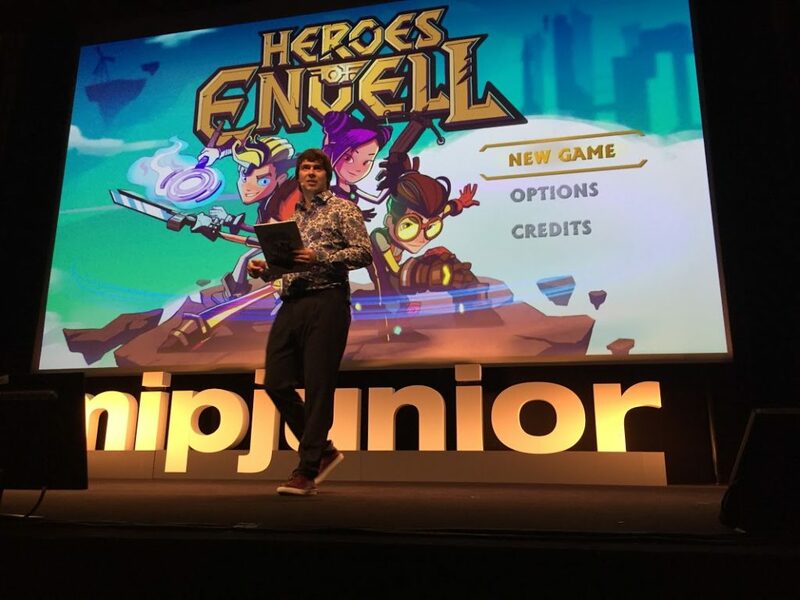 At the end of the screening, Anton Lanshakov, director at Parovoz Animation Studio (shown above) elaborated on what else makes Heroes of Envell special. The creative team made every effort to ground the series in reality. A closer look at each episode will reveal heavy cultural references: Posters of John Lennon and Nirvana line walls, for example. “We have dozens of secrets and easter eggs hidden throughout episodes—even secret coins hidden in the background!” Lanshakov declared. Heroes of Envell was produced for Digital Television Russia by Parovoz Animation Studio. It’s been translated into 10 languages and is ready for life on channels, OTT and online. A special 3D version of the series will also be available via the Moolt VR interactive app.